Wow, great interview. You have connections! I'm hearing about Zhu Zhu every where. Excellent interview, I always wondered what it was like for a Santa meeting all the children. I always imagined it would be funny and enjoyable:)Sounds like it is! That was too funny! How great to have those stories to share! I love Santa's math comment! He's great! What can I add? WONDERFUL on so many levels!!!!!! What a cute idea, Ellen! Can't wait until I'm in Santa's spot! Where. did you get that picture? It is just too much. 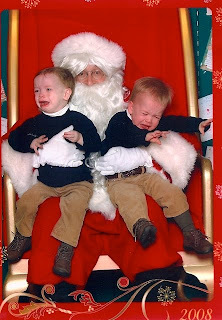 Actually, that's the exact reason I just skipped the whole Santa thing this year. I'm not even sure I like Santa--don't tell my mom.